This Software Testing Plan is included in editable Word format that can be customized in Word or by using the included Wizard software. 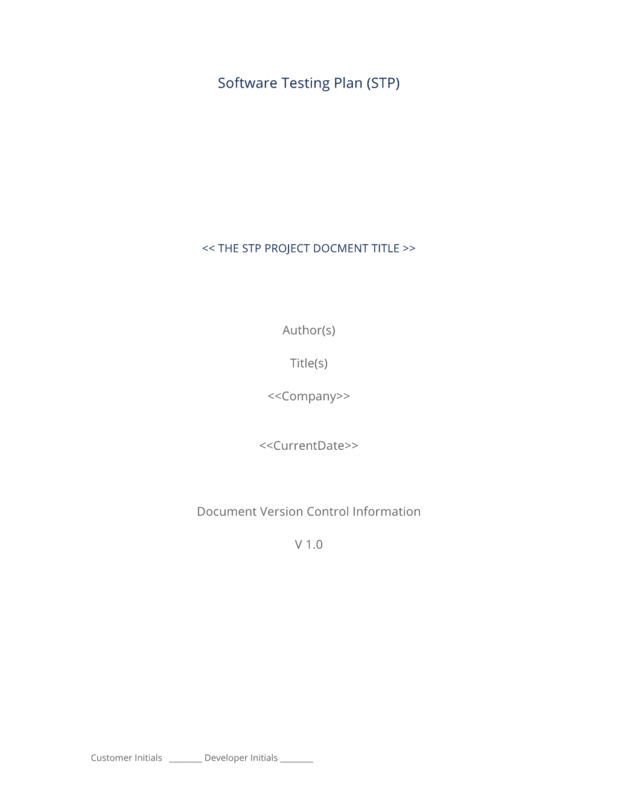 THE STP PROJECT DOCMENT TITLE. Insert description of the scope of this Software Testing Plan. Insert an overview or brief description of the product, software, or other desired end result that is being tested under this Software Testing Plan. The individual items to be tested. The purpose for testing those items. The individual features to be tested. The individual features NOT to be tested. The managerial and technical approach to testing. The criteria for pass and failure of testing. The individual roles or responsibilities of participants in testing. The milestones and deliverables required for testing. The schedules and timelines for individual tests or the Software Testing Plan as a whole. The risk assumptions and constraints placed upon the Software Testing Plan. Software Bug, Error Correction, or Defect Removal Guide. Insert the objectives and requirements for the overall approach to testing. The approach should cover such major tasks as the identification of time estimates for each element of the Software Testing Plan. Identify the different types of testing and describe their testing methods and the criteria for evaluating such testing. Your Software Testing Plan may contain several different approaches for certain elements. Insert the objectives and requirements for testing that the software's recovery and restore operations function correctly and all backup systems and procedures work as intended in the production environment. Insert the objectives and requirements for testing that the software or system meets all criteria and deliverables. The Acceptance Testing is important to ensure that all requirements are met and that all components, modules, hardware requirements and recovery and restore operations function in the production environment and that a plan exists to demonstrate such functionality for a customer. Insert the objectives and requirements for testing that will be done by a customer to verify that the software meets all deliverables and requirements from the Software Requirements Specifications (SRS) or the Software Development Plan (SDP) and to detect any errors, bugs, or defects in the software. A description of tasks and the skills required for performing testing as a part of the deliverables. A description of the hardware and environmental requirements for performing testing as a part of the deliverables. Focus on restraints such as resource availability, time constraints, staff and developer availability, and all other external factors that can influence testing. Insert a description of the contingency plan for each item listed above. A description of the Software Testing Plan change request and change management procedure. Describe the process that must be followed for submission, review and authorization for all requests for change to the Software Testing Plan or any change to any part of the deliverables. A description of the personnel authorized to approve the Software Testing Plan. Their Name, Title and signature must accompany this document. Date when the contact was signed. The complete Software Testing Plan - with the actual formatting and layout - is available in this Contract Pack.